It is a real delight to join you at the lunch of your annual Away Day. Lord Rothschild is an old friend. 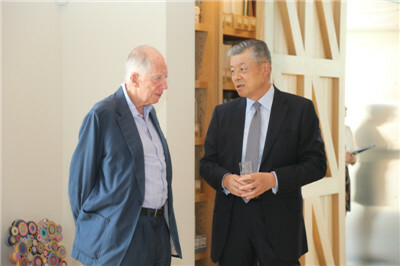 I appreciate his continued support for China-UK cooperation, not least through his many visits to China. 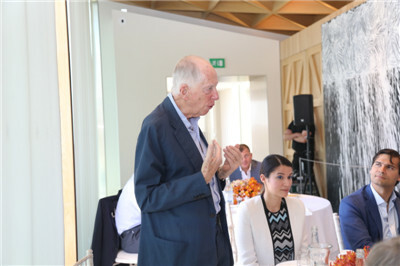 Lord Rothschild asked me to talk about China’s economy and China-UK business cooperation. So let me share with you some of my views on this important issue by starting from the latest developments in China. First, China’s growth outlook is bright. From high-speed growth to high-quality growth, China’s economy has found new driving forces. To achieve steady progress, China is deepening supply-side structural reform to build a modern economic system. We are fighting three battles now, namely, fending off major risks, achieving targeted poverty alleviation, and preventing and controlling pollution. Emerging industries born out of the latest round of technological revolution and industrial transformation are expanding, replacing traditional driving forces and playing a leading role in economic growth. The achievements have been remarkable. In recent years, China has maintained an annual growth rate of 7.1%, and contributed over 30% to world economic growth every year. China has become a major power house and stabilizer for world economic growth. At the beginning of this year, the IMF once again upgraded China’s growth forecast to 6.6%. This is a demonstration of confidence in the prospects of China’s economy. In the first quarter of this year, China’s GDP grew at 6.8%. The total volume of foreign trade in goods stood at 11.63 trillion RMB yuan, up by 8.8% over last year. These figures show that China’s economy has solid foundation, necessary conditions and strong driving forces to remain on an upward trajectory. Second, China will unequivocally continue to reform and open up. This year marks the 40th anniversary of reform and opening up in China. China has taken giant strides in the past four decades thanks to this policy. China will achieve high-quality development in the future by adhering to this policy. Reform and opening up is China’s strategic choice based on our need for development. It is also an important part of our concrete action to promote economic globalisation and bring benefits to the world. Going forward, China will continue to deepen all-around reform. At the same time, China will continue to uphold a win-win strategy of open-up by opening wider and on all fronts. This reaffirms China’s commitment to the reform and opening-up policy. It also points to the direction of China’s economic development in the future. Third, China is firmly committed to building an open world economy. Do we want free trade or protectionism? Should we support globalisation or “de-globalisation”? Will it work if everyone puts his own country first or should we engage in win-win cooperation? I have published several articles on British newspapers this year to elaborate on China’s position. Trade disputes between China and the US come and go. But deep down, this is much more than just a problem of trade. It reveals a conflict of views on the world, on development and on cooperation. Here I want to emphasize that both history and our current experience have proven three points. Third, there is no winner in a trade war. Some in this world still believe in “zero-sum game”. They keep backpedaling by resorting to unilateralism and protectionism. And their inability to honour commitments will end up hurting all parties involved, including themselves, as well as undermining the multi-lateral trade regime and increasing the risks and uncertainties of world economy. China has benefited from the international trading system. We have made contribution to and firmly supported this system. The UK has been a champion of free trade and international rules, and is working to build a “global Britain”. China stands ready to work with the UK to uphold the multi-lateral trade regime, build an open world economy and make economic globalisation more open, inclusive, balanced and win-win for all. The China-UK “Golden Era” has shifted into a higher gear. At the beginning of this year, Prime Minister May paid a successful visit to China, and came back with fruitful outcomes in China-UK cooperation across the board. This has underlined the strategic, practical, global and inclusive features of our bilateral relations. Only by seeing and seizing the trend can we grab the unusual opportunities in unusual times. What are the opportunities for China-UK business cooperation in this new era? I think there are four major opportunities up for grabs. First, China’s economic restructuring is an opportunity to open up new areas for cooperation. Thanks to years of development, China now has the world’s largest middle-income group of over 300 million with an ever growing consumer demand. This number is still growing at a fast pace, and is expected to reach 600 million in 2030. These measures have created enormous room for the development of emerging industries. According to a latest report of Goldman Sachs, China has created new opportunities for the world through the development of the new industry, the internet, new consumption and the health economy. First, manufacturing sector such as automobile and high-end consumer goods and service sector such as tourism and insurance resulting from upgraded consumer needs. Second, livelihood-related areas such as medical care, education and elderly care. Third, urbanization-related planning, designing, intelligent transportation and new energy. China and the UK have complementing advantages in all these areas, and thus enjoy a huge potential for cooperation. Second, China’s innovation-driven development is an opportunity to create new highlights in China-UK cooperation. China is shifting from a development model that relied on natural resources and capital to one that is driven by innovation in science, technology, management, business model and culture. and encourage business startups and innovation. With 750 million internet users, China’s online retail has been growing at an annual rate of 30%. The size of the sharing economy has reached 3.5 trillion RMB yuan and annual mobile payment stands at 158 trillion RMB yuan. I believe those of you who have been to China would have been impressed by the strong driving force and huge investment potential behind China’s “four great new inventions”, that is, high-speed rail, e-commerce, mobile payment and sharing economy. Last December, our two countries issued the Joint Strategy for Science, Technology and Innovation Cooperation. The Pitch@Palace China founded by The Duke of York has gained great popularity in China. The building of the China-UK Innovation Industrial Park in Qingdao is progressing steadily. Moving forward, high-tech, digital economy and innovation industry are areas where China and the UK could further enhance cooperation in order to add new driving forces into our overall bilateral relations. Third, China’s further opening up is an opportunity to set a new example for cooperation. and create a more favorable investment environment. The latest good news came last week when China announced that it will lift the ban on imports of British beef. In the coming 15 years, China is expected to import $24 trillion of goods and open up a $2 trillion market for foreign direct investment. These are good news for companies from all countries, Britain included. We hope that more and more British companies and financial institutions will invest and establish a foothold in China and benefit from China’s development dividends. There is plenty of good news between China and the UK. During Prime Minister May’s visit to China at the beginning of this year, our two countries signed business contracts worth about £9.89 billion. Since the end of last year, China announced major measures to raise the limit on foreign ownership in banking, securities and insurance sector joint ventures. The financial sector is unveiling a new landscape of further opening up. 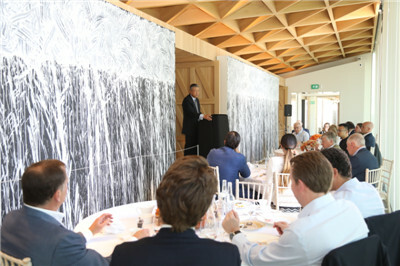 The Shanghai-London Stock Connect, which is expected to be launched soon, will take China-UK financial cooperation onto a new stage. Not long ago, the Agricultural Bank of China opened its London Branch. 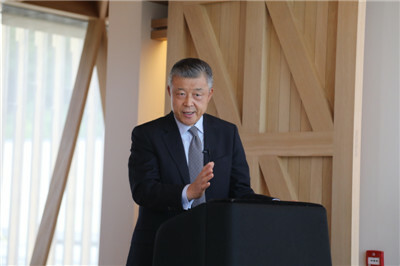 Both the Industrial and Commercial Bank of China and the Bank of China issued green bonds in London, giving their endorsement to London as a green financial centre. We will also encourage more Chinese companies to invest in Britain. We stand ready to enhance cooperation with the UK on infrastructure development, high-end manufacturing, investment, financing, financial services and trade. Together we will continue to take the lead in and set as an example for cooperation between the East and West. This coming November, China will host the first International Import Expo in Shanghai. This is the world’s first import expo ever held at the national level. The UK will be a guest of honor at the Expo. I urge British companies to take part in the Expo, introduce their products and services to the Chinese market, and explore new growth point for trade. Fourth, the Belt and Road Initiative is an opportunity to point to the new direction of cooperation. and the first to appoint a BRI special envoy and set up an Expert Board. UK enjoys close relations with countries along the BRI routes and has unique strengths and rich experience in the financial, legal and consulting. This promises huge potential and promising prospects for China-UK cooperation on the BRI. and jointly develop a third market. Together we could build up cooperation brands, create highlights and deliver win-win results to all the parties involved. Recently I went back to Beijing and had the honour to attend the Central Conference on Work Relating to Foreign Affairs. At the Conference, President Xi Jinping pointed out that China is in the best time for development since modern times. The world is experiencing profound changes unprecedented in a century. This best time of China and the unprecedented changes of the world are intertwined and mutually reinforcing. China is full of hope and opportunities. This great vessel of China is sailing with the currents of multi-polarization and globalization. I am sure my friends from the British business and financial communities present today will appreciate the historical trend, seize the opportunities of China’s development and deepen mutually-beneficial cooperation. I hope you will join hands with your Chinese partners to contribute more “golden fruits” in the China-UK “Golden Era”, and do your bit for building a community with a shared future for mankind and contribute your part to creating a better and more beautiful world.